The first hummingbirds start migrating northward in early spring, showing up in southern Texas, Louisiana, and northern Florida in late February and the first week of March. It takes a little while longer for them to start showing up in my garden, but they usually show up just when the red buckeyes are in full bloom. This tends to be around mid- to late-March. This is when I’ll hang my hummingbird feeders in my garden. There is a great resource available online that shows reports of ruby-throated hummingbirds each year. By viewing this map and seeing when the birds are first reported in different areas, you can get a good idea when to put up your feeders. Read my review of popular hummingbird feeders to find the one right for you. This map of hummingbird sightings is managed by the folks at hummingbirds.net. People around the country can submit their sightings to this website and the webmaster adds a dot with the date on it manually. It’s a helpful tool and kind of fun to keep watching. If you keep an eye on it, you’ll know how quickly the hummingbirds are heading north and you can get your hummingbird feeders up in time to greet those tiny travelers. When the early hummingbirds start to arrive, there isn’t much in bloom, so adding the early blooming flowering plants to your garden – in addition to hanging up hummingbird feeders – can help attract the birds to your garden. 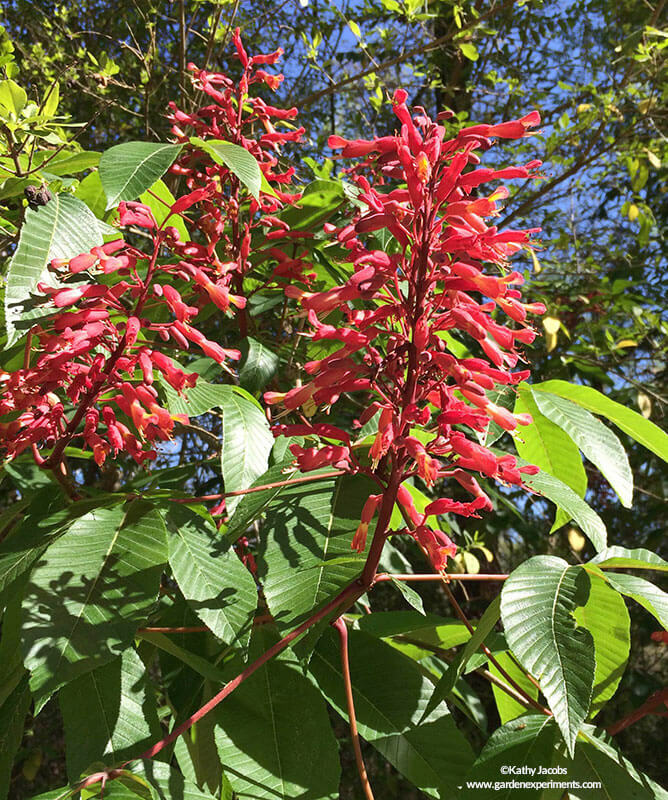 In my opinion, one of the best early spring bloomers for hummingbirds is red buckeye (Aesculus pavia). When walking on our local riverwalk path in early spring, there are always lots of hummingbirds flying from buckeye flower to buckeye flower as early as March. These flowers also attract the red-spotted purple butterflies as they emerge in early spring. This beautiful red flowered honeysuckle (Lonicera sempervirens) is native to the U.S. and is not as aggressive as the Japanese honeysuckle that is nonnative. It begins to bloom in March and may continue through June. 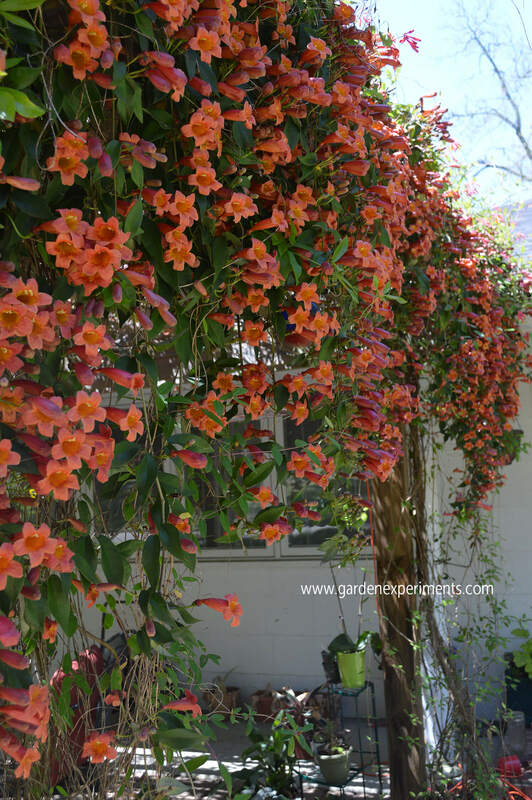 Another native vine, the crossvine (Bignonia capreolata) produces large tubular orange/yellow flowers that will attract hummingbirds. It blooms in March through May. I’ve had one growing on an arbor that got covered in blooms – so pretty! There are about 17 species of azaleas that are native to North America and they come in all sorts of colors. Some will bloom as early as late March, while others don’t start until early summer. Some have a sweet fragrance and some have little to no fragrance. Check out the list of azaleas on the Azalea Society of America website. Columbines produce drooping colorful flowers from tall stems. The native columbine (Aquilegia canadensis) produces red and yellow flowers from February through July. They may be tiny flowers, but the hummingbirds like them! Read about other plants that attract hummingbirds to your garden.